Good morning! The World Card Making Day festivities continue! 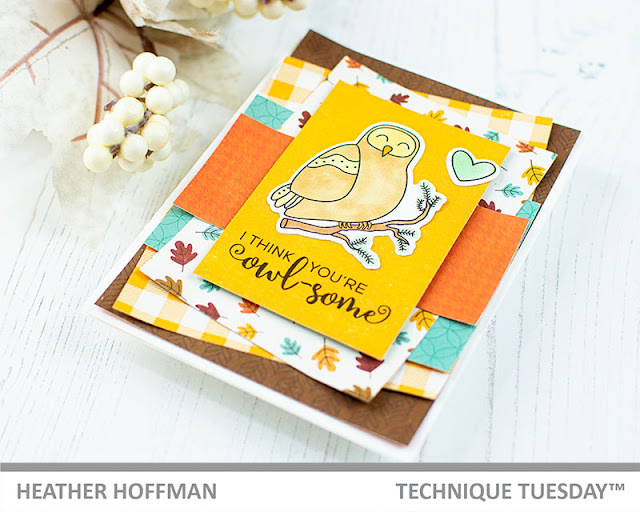 Next up is a fun blog hop with Technique Tuesday featuring a special release for today called You're Owlsome - read all the way to the bottom to see how you can snag it for free - as well as how to enter the giveaway for a chance at a Technique Tuesday gift certificate! I kind of have a thing for pattern paper - and I long ago learned that it was better to use it than to hoard it. So...there is nothing I love better than layering up a ton of it on one card like this! This pattern paper is from an older Echo Park fall paper pad - but really, you can do this with any pattern paper! I love using from either the same pad, or within the same company, since many of the colors and patterns work well together that way. I also tend to add adhesive only to the centers of the pieces of cardstock, and intentionally curl up the edges of the paper. This is a good way to magnify the layered effect a little extra! I stamped and colored up these sweet images, die cut them with their coordinating dies, and added a stamped sentiment from the set underneath as well. 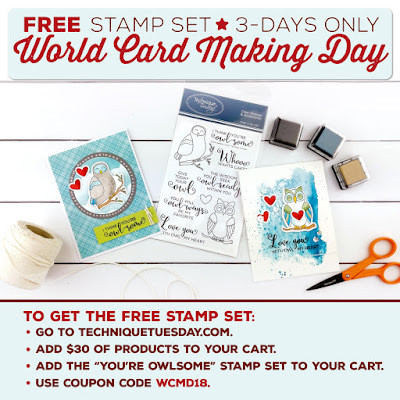 Soooo...here is the sale info - and how you can snag this stamp set for free this weekend! 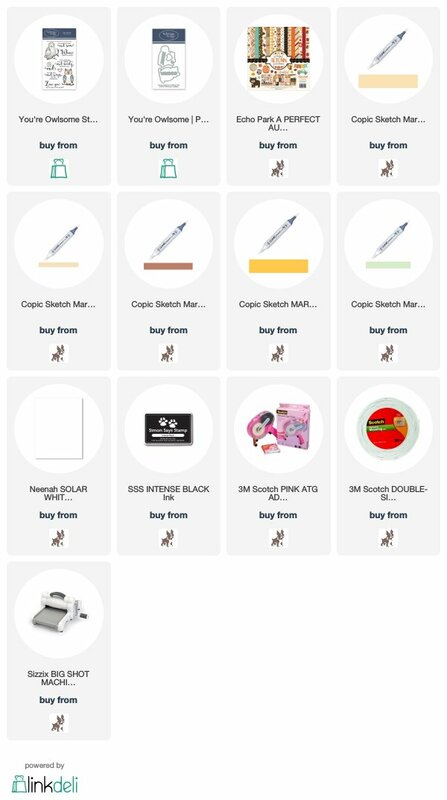 Make sure and leave comments along the way as you hop - there is a Technique Tuesday Gift Certificate up for grabs! Comments may be left through Monday, October 8, 2018. Winner will be announced on the Technique Tuesday Blog on Wednesday, October 10th. Hi, Heather! I adore this card. The color combo is perfect for the owl! Thanks again for taking part in the hop! Love the cards! Great colors! Cute owl and love the fall papers you used. I love the patterned paper layering! What a great idea! 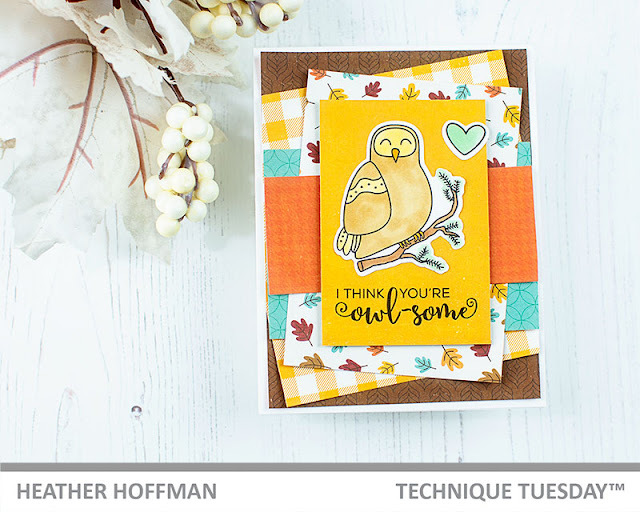 Love those gorgeous layers of patterned paper and how you matched your owl colors to it! It's funny that the idea of adhering only the center has never crossed my mind. It does give a really nice effect. Patterned papers add so much! I like the card layout. Great idea ~ Layer it up. I have a tendency to hoard paper. HMMM, food for thought! Your sweet little owl is adorable! I love his fine fall colors too! Whimsical and touching! seems rather taken with himself. Happy WCMD! Such a beautiful card! :Love the layers! thank you for the inspiration! Such great fall colors. Wonderful job on the colors for the owl! This card is too cute. Love the layering look, will have to try more of that. Thank you. I like the colors you chose for your awesome card. I love your card. I love pattern papers too and learned one day, why hoard it?? It's there to use and enjoy!! Fun and happy card! Love all the layers. Fantastic! Pretty card! Love your layering and that adorable owl! Great colors for fall! wonderful fall card...love the layering of papers. I just love the way you layered the paper on your card! So cute! Fantastic card! 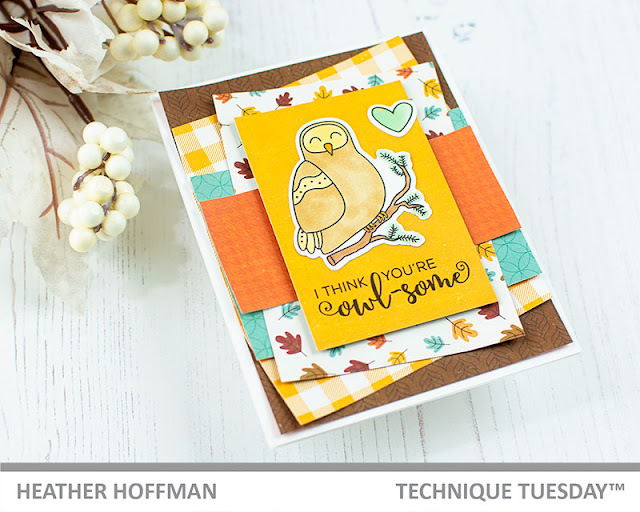 I am so loving the different colors, patterns and layers that you did in creating this amazing card! And how the owl's colors match so nicely to them too! what a fun way to use pattern paper! !